Yale University Press, 9780300169690, 336pp. In the first-ever account of Bayes' rule for general readers, Sharon Bertsch McGrayne explores this controversial theorem and the human obsessions surrounding it. She traces its discovery by an amateur mathematician in the 1740s through its development into roughly its modern form by French scientist Pierre Simon Laplace. She reveals why respected statisticians rendered it professionally taboo for 150 years at the same time that practitioners relied on it to solve crises involving great uncertainty and scanty information (Alan Turing's role in breaking Germany's Enigma code during World War II), and explains how the advent of off-the-shelf computer technology in the 1980s proved to be a game-changer. 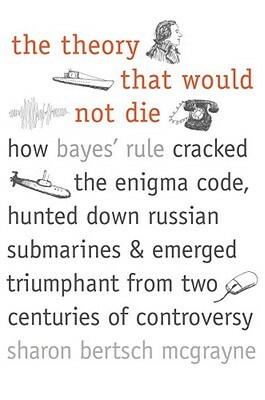 Today, Bayes' rule is used everywhere from DNA de-coding to Homeland Security.